But was it? 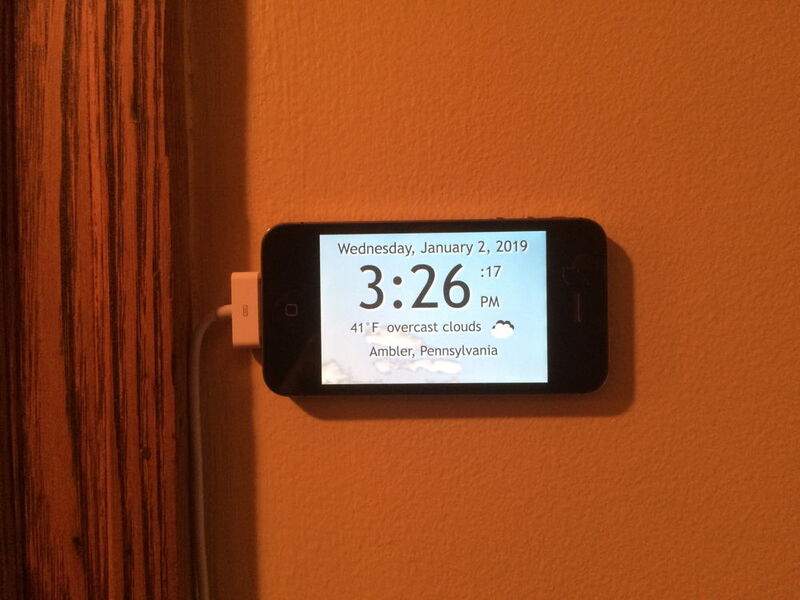 It occurred to me that I could repurpose the old iPhone to create a useful weather clock for our hallway. In the process, I discovered that reusing an old device is not only fun and economical, it can also deepen your understanding of web standards. In this tutorial, I will show how I created a small web page to display the date, time, and current weather conditions based on the current GPS location. Together, we’ll retrieve weather data from a public API and hide an API key in a PHP file for security. Finally, we’ll look at adding a manifest file and meta tags so that users can save the page to a device’s home screen and then launch it as a standalone app, including a custom icon for it. Step 1: What time is it? See the Pen Wall Clock by Steven Estrella (@sgestrella) on CodePen. I wound up taking things up a notch by creating styles specific for the time of day and we’ll definitely get to that as well. We could even leverage a media query to darken the daytime style for Mac users who have dark mode turned on in the latest MacOS. The <span> tag with the running seconds and meridian will wrap nicely based on a width of 2em which is just large enough to accommodate two capital letters (i.e. AM and PM). The final CSS that’s needed is a media query to bump up font sizes when the clock is in landscape mode, or really any device with a viewport wider than 480px. We need variables for the current date and time (now), the element that will display the date (dd), the element that will display the time (td) and the names of the months and days. Once the page is loaded, an init function is called to update the time every second (1000 milliseconds). The getClockStrings() function updates the value in the now Date object and returns an object containing HTML strings for the date and time. Then the updateTime() function updates the HTML to show the time. One lesser-used feature here is the inclusion of the toISOString() method of the Date object which adds a machine-readable date string to the datetime attribute of the two <time> elements. See the Pen Clock with GPS by Steven Estrella (@sgestrella) on CodePen. The Geolocation API is an easy way to get the user’s accurate location. We can do that when the page loads, but good manners and Chrome’s best practices audit dictate that we ask the user to initiate the location feature. So, we must add a button and a <div> to the HTML to display the GPS information we receive. These new items require their own styles — mine can be seen in the embedded Pen above. The important thing is to add the class selector rule for the infotext class as well as the two ID selector rules for the gpsbutton. Finally, we’ll need to add the modified infotext class selector rule within the media query. At this point, the browser will ask the user for permission to obtain their GPS location. If the visitor refuses, an appropriate message is displayed. If the user approves, the showPosition() function then displays the latitude and longitude and hides the GPS button. Step 3: How’s the weather? 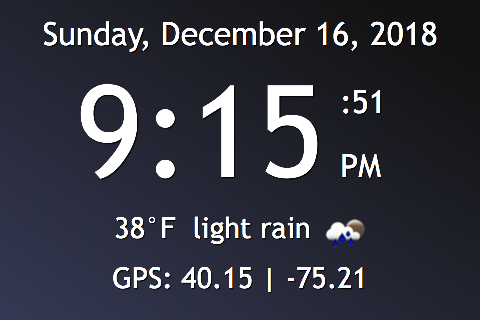 Adding current weather conditions to this clock is a useful feature. Fortunately, the good folks at OpenWeatherMap.org allow access to basic weather information for free. Sign up for a free account there and you will be given an API key you can use in your web development. The free account provides current conditions and 5-day forecasts for any valid GPS location you throw at it. Just be sure to call the API no more than 60 times per minute or you will be prodded to upgrade to a paid account. Once you have an API key, substitute it for the words YOUR_API_KEY_HERE in this code sample and then paste the code into the browser’s location bar. You will receive a JSON object containing the weather for my location here in Pennsylvania. Experiment with different latitudes and longitudes. You can find coordinates for any major city at LatLong.net where the coordinates are given in the decimal format you need. See the Pen Clock and Weather by Steven Estrella (@sgestrella) on CodePen. We need to add variables to reference the weather URL, the weather <div> (wd), and the weather icon. We also need to decide on Fahrenheit or Celsius. The Boolean value for usephp should be set to false for now. We will discuss hiding your API key in a PHP document a little later. The locationRequested Boolean value will help us avoid calling the weather and geolocation APIs before the user has requested them. The sunset and sunrise time variables will allow us to change the appearance of the clock based on the time of day. The iconurl value provides the stem of the URL we need to retrieve weather icons. We also need a random number between 0 and 14 to use in our updateTime function so that all our users don’t request weather at the same minute each quarter hour. If you have your own set of icons, you can change the URL value for iconurl . The file names for the PNG icons are available at OpenWeatherMap.org. Next we will modify the final if block of the updateTime() function. We wish to avoid unnecessary calls to the weather and geolocation APIs so it is important to test for sec === 0 to be sure we don't call either API 60 times in a given minute. We also wish to call the APIs only if the user has approved the browser’s geolocation request. In the showPosition() function, the URL to request the weather data will be either a relative path to the PHP file or a full HTTPS URL pointing to the OpenWeatherMap.org service. In both cases, we will be passing the latitude and longitude in the query string of the URL. For the APPID, please substitute your own API Key for the words YOUR_API_KEY_HERE unless you are using the PHP solution discussed in Step 4 below. The showPosition() function then calls getWeather() which updates the weather <div> to let the user know something is happening while the weather data is being retrieved. I opted to use the older XMLHttpRequest standard because fetch is not supported on old devices like the iPhone 4s. If the weather data request is being channeled through a PHP document, the response type will be "document" rather than plain text so we have to test for that. If that is the case, the JSON object we need will be in the textContent property of the body of the response. Otherwise, we only need the plain text found in the responseText property. The data is then parsed as a JSON object and sent to the processWeather() function. From this JSON data, we need to grab the weather property that contains the description of the current conditions and the filename for the weather icon. The <img> tag in the html that has the ID of "icon" is then updated with a new src property value to load the icon image. The temperature is part of the main property but it has to be converted to Fahrenheit or Celsius (most humans don’t think in Kelvin). When that is done, the current conditions can be assigned to the innerHTML property of the weather <div>. The times for sunrise and sunset are found in the sys property of the data. Once we have those, we can call the checkForSunset() function and modify the style to match the time of day. Step 4: Do I really have to show you my API key? I used a disposable API key to create a working demo. Generally, however, putting an API key in plain text within the code of a front-end web application seems like a bad idea. Others might copy it and use up your API access quota. If you have access to a typical web server (CodePen doesn’t do PHP), you can hide the API key in a PHP file. Here is some sample code. Substitute the API key and upload the file as clock.php into the same directory as the main HTML file. The PHP file serves as a sort of proxy to the OpenWeatherMap API that we’re using to fetch data in the demo. If it has any problem retrieving weather data, it simply returns an appropriately structured object with "Weather Unavailable" as a description and a temperature that converts to 0° Fahrenheit. The API key is never transferred from the server to the browser so there is nothing for prying eyes to see. I would be interested to hear from readers if you know of a secure, serverless solution to hiding an API key (Netlify or Docker perhaps?) because it’d be nice not to have to spin up our own server to store and hit the data. Chime in if you have some thoughts. If anyone else tries to use this PHP file from another domain, the browser should throw an error like the one in the following example. 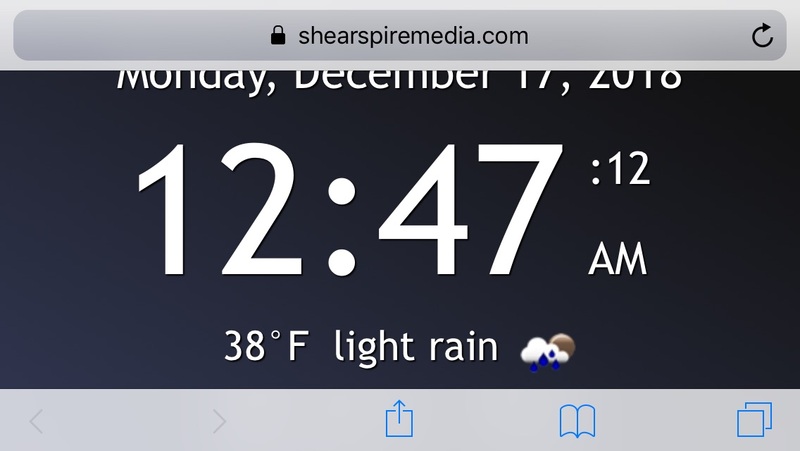 I loaded a copy of the weather clock on my makepages.com domain and tried to access the PHP file on my shearspiremedia.com domain. These days, the same-origin policy is in place by default on typical commercial web server installations. You might need to confirm that is the case on the server you are using. [Error] Origin https://makepages.com is not allowed by Access-Control-Allow-Origin. [Error] XMLHttpRequest cannot load https://shearspiremedia.com/demos/clock/clock.php?lat=40.14616446413611&lon=-75.20946717104738 due to access control checks. Step 5: Can I please go full screen? Once the app is up and working, it can load on any smartphone browser. The iPhone, however, is forced to endure the presence of the location bar and footer. Yuck! Home screen icon for my Weather Clock. Finally, we need to add a bunch of meta and link tags in the head of the HTML file to make this all work. Here is the completed index.html file code including all the head tags you can’t see on CodePen. The visitor can now tap the share button on the iPhone and choose “Add to Home Screen.” An icon will appear that will launch the clock as a full-screen standalone app. Enjoy! See the Pen Clock and Weather IP by Steven Estrella (@sgestrella) on CodePen. If the user’s exact location isn’t a requirement, we could avoid the Geolocation API entirely and get the approximate location using any of several IP address services. In the demo above, a JSON object is received from extreme-ip-lookup.com to get the approximate GPS location of the user. That displays the city and region values found in the JSON instead of the GPS coordinates. 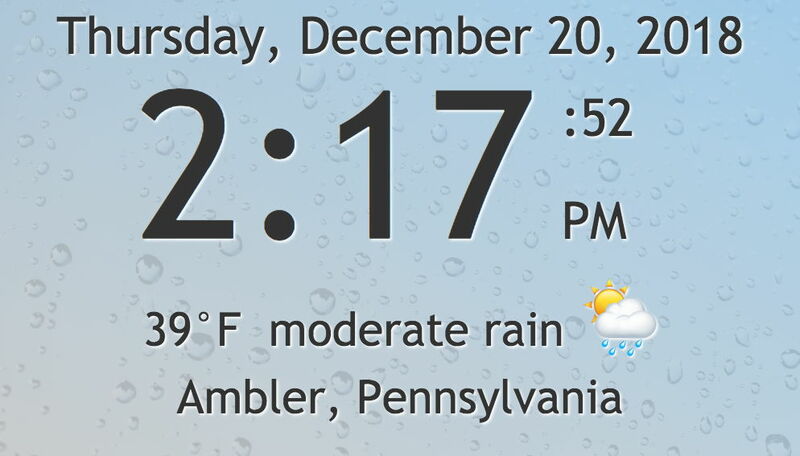 It should be clear to the user in this case that the weather location is a neighboring town. Since IP information is part of the normal request for a web page, an argument could be made that there is no ethical problem with displaying IP location information without user permission. That eliminates the need for the GPS button altogether. I actually switched the final app to use the IP address location feature with geolocation only as a fallback in the event the IP location service is down. I also added more weather information, custom background images, and custom weather icons to correspond to current weather conditions. The custom icons are available at this Pen. The final app is available here on my ShearSpireMedia.com site. I also created a Pen that generates a starry sky for night mode that can be used to make a night background. We can teach an old device new tricks. The Geolocation API isn’t all that scary. Fetching and using data from an external API is useful. Using a small PHP file is one easy way to hide your API key from prying eyes. Working with user permissions is a good (and often required) practice. Like I mentioned earlier, a serverless solution for storing data would be ideal here, so if you have any thoughts on that — or really any ideas or questions at all — please let me know in the comments! Thanks for the comment, Andrew. One thing I didn’t mention is that I used Command Picture Hanging Strips by 3M to mount the phone on the wall. They contain an adhesive that doesn’t damage the wall and will hold up to 2 lbs of weight. You could try Netlify — they support cloud functions so you can write the server side in JS and access it from a static site. Thanks Jed. I will look into Netlify a bit more. I just reviewed the docs and I think I see how this might work. If I get it working I will post a CodePen and link it here. This is cool — The only thing I’d worry about is power. Maybe it would be good to store the phone near a window with some kind of small solar panel. Hi!, Can I only use the IPhone4 – Or can I use any cell phaone – Like the a Samsung 6 ? I’m sure I have an old iPhone lying around. I need to try this neat project. Good luck. I updated the iOS version on my iPhone 4 to the most current one it could handle (9.3.5) before I started the project. That ensured that the Safari browser would be as current as possible. As long as you use ES5, it should work fine. Fun, does the phone fall asleep after a certain amount of time? Hi Jim, I set my iPhone 4 to never sleep (Settings –> General –> Auto Lock –> Never). It stays awake all the time and will likely serve reliably that way for a few years to come.